It has been a year since John Henry Booth's exile from New America and the fall of the Black Cathedral. 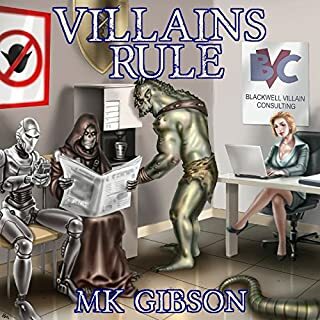 Cursed with a slow transformation into a monster, he has begun a doomed relationship with fellow escapee Mercury Halsey as they seek some way to arrest his transformation. Dubious hope arrives in the form of the University, the deranged scientists and cultists descended from the staff of Miskatonic University. Except their offer of help comes at a price. 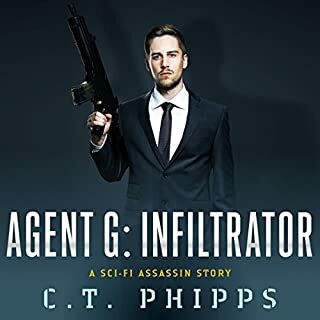 Having sold themselves to ancient aliens called the Yith, they wish John and Mercury to join a group of rogues in hunting down a wayward member of their faculty: a man who intends to release the last of the sleeping Great Old Ones on an already ravaged planet. If they're telling the truth, John and Mercury will be heroes. If. 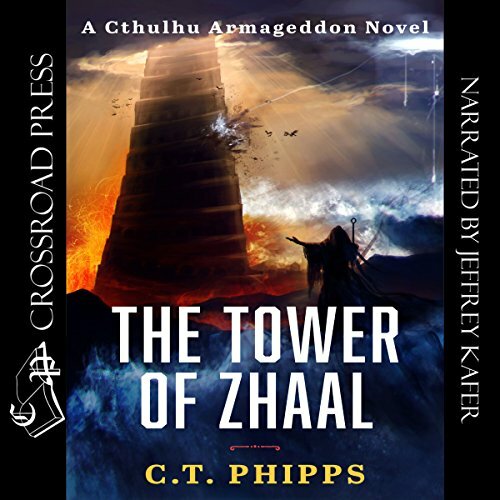 The Tower of Zhaal is the second novel of the Cthulhu Armageddon series, a post-apocalyptic continuation of H.P. Lovecraft's popular Cthulhu Mythos. As a fan of the Lovecraftian Cthulhu, and all of the mythos and pantheon that entails, I was surprised by the level of dedication here. 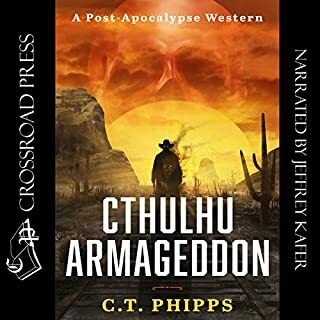 Not only did Phipps capitalize on the pre-existing characters, but he created plausible NEW Elder Gods, which made me question whether or not they were also pre-existing! Kafer is, as always, an awesome voice-actor, so there was no problem with listening vs. reading. I'll actually admit, I trust his pronunciations more than the ones my brain conjures up (not a hardship, though, as my brain tends toward pronouncing words phonetically, like: epitome...) Anyway, this was a very enjoyable read, with a really good balance of history, fiction, and fantasy! I don't know why I didn't see a sequel coming from the first book, but I'm really glad that Phipps wrote one. The benefit of a sequel is that you've already had time to explain out certain characters and their characteristics, but it also allows you to explain the world a little bit allowing you to jump right into the continuation of a story. Well, Phipps did that for sure. I thought that Cthulhu Armageddon was non-stop action. I would be wrong compared to Tower of Zhaal. Holy cow, I need to catch my breath from this one. Another thing that I really enjoyed was the addition of new characters. Phipps was able to weave new people into the story without them feeling like complete outsiders. The story itself from the first book wasn't normally my cup of tea, but darn it did I still enjoy it. The Tower of Zhaal was the same way. I went into it with an open mind and having read the first book. I wasn't sure what was going to happen in this book, but I was bucked up for the ride. I'm glad that I was buckled up though because this one too me for a ride. Anytime you can get the amazing Jeffrey Kafer to narrator your books, you already have an edge up on the competition. But when you combine Kafer's great narration of this book with Phipps great writing you have a winner. 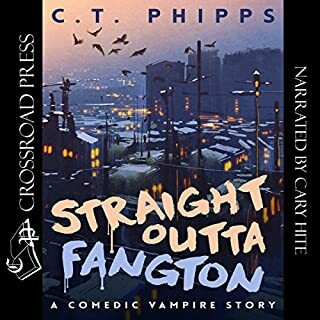 I was given a free copy of this audiobook, it has not affected my review in any way. Zhaal was pretty darn good and it reminded me that I definitely need to dig deeper into the Cthulhu Mythos (is there even an official canon?). I definitely feel that I would have been better served if I'd read/listened to the first book of this series, although the recap at the beginning kind of brought me up to speed. Wow. Just wow. Phipps does a pretty darn good job describing the indescribable horrors of Lovecraft's world. I've had trouble picturing the assorted old ones, shoggoths, et al, in the past, but I was drawn into this world I'd never want to wake up in. Narrator Jeffrey Kafer is very well suited for the role. I've enjoyed his performances of the D-List Supervillain books as well as Phipps' own Saga of Supervillainy. He brings his trademark level of snark and believability to his reading--although this time around he's definitely much more ominous sounding. While I enjoyed The Tower of Zhaal I can't recommend it for everyone. It's dark, gory, and messes with your mind. If you're a fan of Lovecraftian horror or post-apocalyptic novels then it might just be up your alley. This story had more depth and world building than the first one. I can't wait to see what book three will bring. I loved the first book in this series, and the sequel did not disappoint. I admit, I squeed like a fangirl when I saw this one published. It picks up a little bit after the end of the first, and we're back again with the hero, John Henry Booth. He's somewhat more than human now, and he and his lover Mercury are recruited to kill someone to prevent the end of the world. 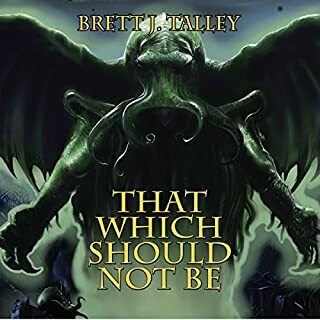 The plot is not quite that simple, and the author really throws a lot of philosophy in there, many questionable choices, the whole Lovecraftian pantheon, and just so much more. It's an enjoyable listen, made even more so by the talented narrator Jeffrey Kafer. Kafer's deep, gravelly voice matches the lead character so perfectly that even when the prose did get a little overwrought and might have sounded silly, Kafer's deep voice brings a seriousness and poignancy to the narration which really makes you feel for the lead, bringing the stark reality of the world to life. If you haven't listened to the first one, do so, but I think this sequel could probably stand on its own as well. Chitinous claws! Tentacled faces! Oh, the horror! Note: This is Book 2 and works OK as a stand alone. It would definitely be enhanced by having previously read Book 1. Set in and around a post-apocalyptic Massachusetts, John Henry Booth and Mercury Halsey now work as security for merchant caravans. The world was reformed some decades back when the Old Ones and aliens took up residence on Earth, nearly wiping out humans. Unfortunately, most of these new arrivals found humans useful in some way or another, such as interbreeding or as a food source. John is undergoing a transformation into an unknown something he fears and perhaps the University can cure him. However, their assistance comes at a price. They must hunt down and kill a powerful sorcerer (wizard? magician?) Marcus Whatley, who is determined to released the last of the Old Ones, potentially dooming both humanity and Earth. Yeah. John and Mercury have their work cut out for them. The end of Book 1, Cthulhu Armageddon, saw the death of much of the cast. Here, we get several fresh faces and, yes, many of them perish in interesting ways before the end of the book. In fact, several folks from the merchant train John & Mercury are guarding die right away when the cultists of Yith show up unexpectedly. Professor Harvey Armitage of the Miskatonic University wanted a word with John & Mercury and this was his douchey way to getting their attention. Right off the bat, I didn’t care for Armitage and I hoped that John & Mercury found an interesting way to kill him off. And yet…. yet Armitage does has a wealth of knowledge and some healing powers. Perhaps this messed up world needs him… for now. Mercury used to be a professional torturer and she’s an expert on EBEs, these extra biological entities. So she’s a pretty interesting character that has had an intense career path. In this book, she continues to grow with some training in the magical arts. She’s done all she can for John as a doctor (of sorts) short of killing him (if that’s possible). Perhaps the magical arts are the only way to assist John in controlling or containing his mutation. I’m interested in seeing how things turn out for the side character Jackie Howard. She’s the teen-aged adopted daughter of John and Mercury and she’s half ghoul. Yes, ghoul. Like Richard Jameson from Book 1, she likes human flesh. But she’s cool. Don’t worry. Donated meat only. There’s this great scene between her and John where John is explaining why they are leaving her behind instead of taking her on this insanely dangerous mission. Lots of great lines in that scene where Jackie acknowledges that John & Mercury care while also calling them on their BS. Jessica O’Reilly, John’s previous girlfriend, shows up later in the book, as well as his ex-wife. As if that doesn’t make his life complicated enough, his ex-wife is a psychic and she can tell that John is hiding his true nature from all but his closest companions. John also has a bit of a crisis of conscious when he and his team end up in a kind of paradise that relies on slave labor. John was a slave for about a year previously, so he has some strong feelings on the subject. Yet this labor pool is made up of these squid faced entities that could happily slaughter all humans planet wide if they were inclined to… and weren’t being held in slavery. So he’s got 99 problems along with his love life. The ending was complete with great imagery and phrases like, ‘We must summon Cthulhu!’. There’s plenty of drama and yet things work out. I hope we get another book in this series because there’s plenty more for John to explore even as he goes through his own evolution. 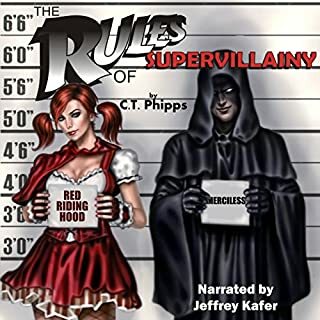 The Narration: Jeffrey Kafer really shows off his skills with this book. This story is full of lots of nearly unpronounceable names such as Nyarlathotep and Shak’ta’hadron and Kafer has to pronounce them all with consistency and accuracy throughout the book. There’s also plenty of crazy cult ramblings in a nearly unpronounceable language, which Kafer makes the characters sound fluent in. I was impressed by the dexterity of this tongue multiple times throughout this book. He’s great at keeping the characters distinct and also imbuing the text with emotion as needed. This was a great story. I actually had to revisit some old Lovecraft and listen to this again to get the full depth of the novel. The narration was great, to have to pronounce all these crazy words must be hard. If you were my friend and liked the Lovecraft mythos, I would recommend this to you.